The case of the Orlando Project offers a useful interrogation of concepts like completion and finality, as they emerge in the arena of electronic publication. The idea of “doneness” circulates discursively within a complex and evolving scholarly ecology where new modes of digital publication are changing our conceptions of textuality, at the same time that models of publication, funding, and archiving are rapidly changing. Within this ecology, it is instrumental and indeed valuable to consider particular tasks and stages done, even as the capacities of digital media push against a sense of finality. However, careful interrogation of aims and ends is required to think through the relation of a digital project to completion, whether modular, provisional, or of the project as a whole. When can a digital scholarly project be considered finally “done”? Perhaps never. Something done is past, irrevocable, requiring nothing more and indeed immune from further action. The case of the Orlando Project, a large-scale and longstanding digital humanities undertaking, reveals an arbitrariness, even a fictiveness or contradictoriness, to the notion of completion of the project as a whole or even of its major online product. Digital humanities projects are considerably more prone than traditional humanities undertakings to riding off into the sunset until the next installment rather than being laid to rest. “Doneness” circulates discursively within a complex and evolving scholarly ecology where new modes of digital publication are changing our conceptions of textuality, at the same time that models of publication, funding, and archiving are rapidly changing. Within this ecology, it is instrumental and indeed valuable (indeed, as Matt Kirschenbaum suggests here, highly satisfying) to consider particular tasks and stages done, even as the capacities of digital media push against a sense of finality. However, careful interrogation of aims and ends is required to think through the relation of a digital project to completion, whether modular, provisional, or of the project as a whole. In the digital humanities we often organize undertakings in terms of “projects”, research endeavours that are probably, ideally, a collaborative enterprise “carefully planned to achieve a particular aim” (Oxford English Dictionary 2007, “project”). The emphasis is on the future, on the projected outcome and potential of the undertaking: projects, as the cognate verb “to project” suggests, are future-oriented. Some — an example would be the nora Project [nora] — last about as long as the money from a particular grant, but others — the Perseus Project and the Women Writers Project are examples — continue over many years and multiple grant funding cycles. A successful project is thus not necessarily geared to realizing a “particular aim”. Perseus as “an evolving digital library” (http://www.perseus.tufts.edu/) situates its work in the vast scale of biological time; the WWP’s aims are equally open-ended. These trajectories of digital humanities undertakings don’t pin themselves to a specific end, but carry “A planned or proposed undertaking; a scheme, a proposal; a purpose, an objective” (Oxford English Dictionary 2007, “project”) into the foreseeable future, with gusto. Such an orientation is actually at odds with the definition of a project in relation to particular aims. The success of these projects is not pegged on completion, but measured in other ways. So there's clearly a lot that scholars involved with such projects want to do without being done, particularly insofar as being undone is compatible with disseminating materials to others and engaging in scholarly dialogue about them. At root is not only, as the introduction here suggests, a culture of perpetual prototypes that mitigates desire for closure, or funding structures that poorly support the “finishing” process for non-commercialized projects. It is also the very multi-faceted nature of much digital humanities research, which so often straddles the divide between content development and technological experimentation. This interplay between traditional humanities content and innovative methodologies means there is always more to be done. The Orlando Project, with its aim of “producing the first full scholarly history of women's writing in the British Isles” (Brown et al. 2006, home page), is a long-term digital humanities project that is both done and yet not done. Unlike many electronic projects, the project held off making its major resource available until it was in quite a polished and complete state. Orlando: Women Writers in the British Isles from the Beginnings to the Present was published online by Cambridge University Press in June 2006. It is not a collection of primary texts, but a massive born-digital resource in literary history amounting now to almost 7.7 million words in the form of 1,206 detailed and often quite lengthy entries on writers’ lives and writing careers, more than 13,000 independent chronology items, and 22,000 bibliographical records. Yet the project is far from done: its content and technical work continue. This paper explores the tension between projection and completion over this project’s history to date as a means of considering that tension in relation to digital humanities research generally. The project’s cofounders (Susan Brown, Patricia Clements, and Isobel Grundy) were new to digital humanities research, so our notions of scholarly process and completion related to conventional print publications. As Claire Warwick has noted, the idea of what is “complete” or “publication-ready” in academic culture has emerged from a complex set of human factors relating to such matters as the attribution of credit by institutions and funding structures, as well as the conception of what is required intellectually for a product to be done [Warwick 2004, 368]. Such factors undoubtedly entered into how the Orlando Project was conceived. In our original funding application, we projected a single moment of completion at which the planned electronic history would be ready alongside several related print volumes of scholarship. We were fortunate to receive a Major Collaborative Research Initiative (MCRI) grant from the Social Sciences and Humanities Research Council of Canada (SSHRC), and embarked on the project as planned. And then things changed. Working at the interface between humanities research questions and evolving digital methods means that projections about the trajectories of digital humanities work are less likely to be accurate than those of traditional scholarship. This is not to say that any research project may not run into snags or unforeseen delays - instances, particularly in the history of earlier scholarship, include Samuel Johnson's having to restart his dictionary mid-stream because he realized that working with small slips of paper would be better than the old technology of full sheets - but these are less often related to the methodology per se of the scholarly undertaking. In the case of Orlando, the ambition and experimentality of what we had undertaken on the technical side had a radical impact on the progress of the literary work with which it was interdependent, both because key researcher time was involved in the development of the custom tagset we developed and successively refined as a key component of our methodological experimentation, and because we had to build in-house production and delivery systems from scratch in ways that we had not anticipated. The risk of these sorts of impacts is endemic to methodologically experimental research of any kind, and particularly relevant to digital humanities work. Such impacts don’t mean that the project is not pursuing its aims effectively, but they can have a major impact on anticipated timelines and perceptions of productivity, especially if the project has been articulated in relation to a particular aim or deliverable. Digital humanists therefore need to plan and sequence with care their deliverables, which are important not only because our work must take objective form to be shared with our colleagues, but also because those are the ways in which we are accountable to the funding bodies that make our often costly work possible. Given the risk-oriented nature of experimental research, it is strategic to promise outcomes that are both multiple and modular. The Orlando Project struggled for funding in later stages as a result, we believe, of a project design that focused on a single, end-loaded monumental deliverable. The big “ta-da!” moment of publication is a very common strategy, one followed by the Blake Archive in 1996 with its release of The Book of Thel , copy F, and then again in 1997 with further fanfare when it released the first SGML version of that text with additional functionality for users, and in 2008 by The Nineteenth-Century Serials Edition, which launched all six serials with a splash. The “ta-da” provides both that crucial sense of satisfaction and progress for the participants and a landmark achievement that constitutes important evidence of completion of at least a phase of the project for funding agencies. It has drawbacks, however. Focus on an end deliverable can obscure interim accomplishments. The Orlando Project's research plan was designed to proceed through a number of stages. Indeed, the milestones and the mid-term review required by the MCRI Program are examples of the kind of official part-done marker which, although it may not arise organically from the research needs or achievements and is imposed from the outside by the bureaucratic rules of another entity, can nevertheless be used by researchers as a spur to setting and meeting meaningful interim goals. Many of those markers were, however, internal to the project, which meant that they didn't provide the same kind of objective sense of progress that comes with public release. Externally, and for our funding agency, what registered was what we had not done, rather than what we had accomplished. An immense online “product” such as that Orlando promised from the outset does well then to be balanced by some objective, interim goals. In addition, the launch that suits a book does run somewhat counter to the ongoing life of many digital projects if it leaves people thinking that the project itself is finished. Other projects have made their way into the world rather differently, in ways suggestive of ongoing curation. The Poetess Archive, for instance, began as a series of rather modest web pages that have grown over time in both scope and sophistication, moving from HTML into XML with a sophisticated search interface. Editorial ventures perhaps lend themselves particularly well to an incremental approach. The Brown University Women Writers Project (http://www.wwp.brown.edu), for instance, first transcribed and encoded texts, made printouts available and partnered with a publishing house, and released Renaissance Women Online. By the time Women Writers Online was made available by subscription, it was clear that, although it was a major event, it was part of a continuing project. Just as software projects typically put out numbered releases, which provide the triumphant moment of celebration while suggesting that more is yet to come, designing projects to incorporate such incrementalism by way of staged releases that mark phases of accomplishment or a number of discrete and in some way publishable deliverables, seems a particularly useful way to structure digital projects. So it seems crucial to design digital humanities projects with a number of discrete and in some way publishable deliverables. Ideally, these should be modular, that is, functionally independent of one another. This means each has the potential for separate funding, can proceed on its own, and can provide a satisfying moment of completion. Modularity, however, suits some kinds of projects better than others. Both content and software systems often rely on the interrelation of various parts that can make it a challenge for one part to develop independently of the others. And even where a high degree of modularity is possible, modules usually need to be integrated at some point, so careful coordination to ensure eventual compatibility is still necessary, as well as an eventual convergence of module completion. Various factors can work against modular publication. Orlando ’s content structure was modular in form, composed as it was of author entries and chronological materials. Each of these theoretically could have been published as soon as they were “done”. Yet doneness there was relative: there occurred a regular effect whereby the production of a new entry spurred significant improvement in several supposedly complete ones. An iterative process developed, not unlike the successive stages required in traditional humanities research, where the gradual accretion of knowledge slowly modifies the researcher’s view and understanding of material. There was a strong sense both that the content work had to progress to a certain point of intellectual maturity, and that there were intellectual demands for a certain degree of coverage. We wouldn’t be “done”, for instance, without having completed the materials on Virginia Woolf or George Eliot. Because much feminist work has resisted the establishment of a small canon of female writers at the expense of others, such major writers needed to be situated in relation to less prominent contemporaries, and because we rejected a separatist understanding of literary history, we needed to include some male and international writers. Despite the apparent modularity of our content, we held off publishing until we had 1,149 entries completed. Thus, where scholarly content is concerned, a certain critical mass may be held necessary to establish scholarly confidence in the quality of a resources. Whether that threshold constitutes a single digital object, such as an edited text, or thousands of objects will vary. But it can work against a modular approach. Further revision is of course possible: the Orlando entries on Eliot and Woolf continue to be extended or revised at almost every update. In this sense, the digital done with its easy accommodation of incrementation is infinitely preferable to the printed done. But any project wishing to publish in stages will have to decide its initial content threshold according to the particular research goals of the project, criteria in the field for scholarly reliability, and user expectations. Technical considerations constitute a further challenge to modular publishing, since a prototype is one thing and a debugged, multiple-browser-supporting, polished publication vehicle is another. We know that users are very easily put off by frustration in the use of new resources or tools, so publishing components that are unstable or poorly integrated may have a seriously negative impact. In the case of Orlando , our customized tagset required us to build a fairly complex XML delivery system, a task we had not anticipated in the mid-90s when TEI-SGML was emerging as a standard and XML was just over the horizon. Only a quite finished interface, we felt, stood a chance of convincing our core users from the technologically-resistant field of literary studies of the strengths of the markup into which the project had invested so much intellectual labour. 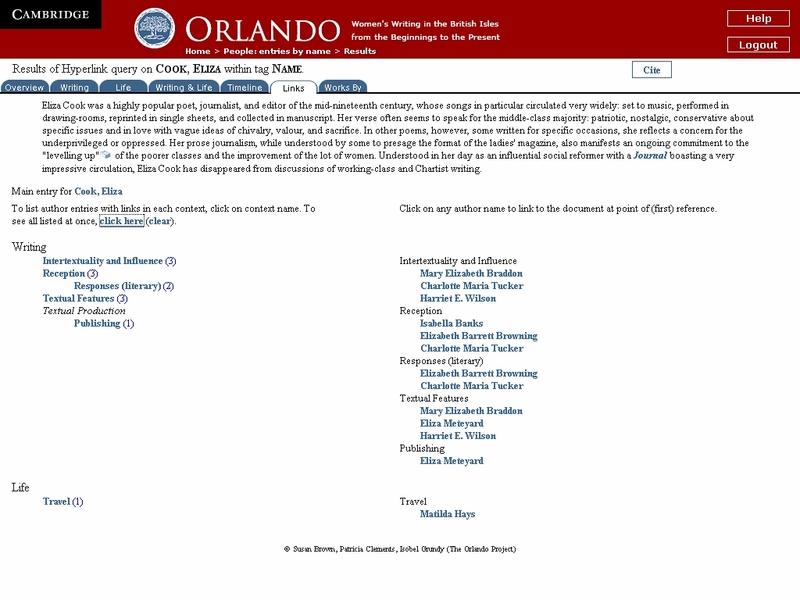 Orlando offers users a range of affordances beyond that of looking up specific writers’ entries, as the menu bar on the home page as it was at initial release (see Figure 1) makes clear. These extend to searching in quite precise ways on the more than 2 million semantic tags embedded in its literary-historical prose. To make the system’s unique strengths apparent, we again needed a critical mass of materials to populate search results and showcase innovative features — such as the links screens that provide semantically-categorized access to mentions of writers across the textbase (see Figure 2). Orlando home page, showing the range of affordances in the left-hand menu. Orlando links screen for Eliza Cook. The right-hand column lists the available links to mentions of Cook in other entries, categorized by context according to the semantic context indicated by the XML tags. Orlando shifted to a more staged publication model by uncoupling the electronic from the print publication, so that the former stands alone initially. Yet the textbase was published relatively complete. Thus, while structuring projects modularly is highly desirable for a range of reasons, truly modular publication may present challenges with respect to audiences from beyond the digital humanities community. Research domain, project conceptualization, and publication options are all crucial determinants of how “done” will be defined for a particular project. Project members need to arrive at a shared understanding of what constitutes an acceptable degree of intellectual maturity, critical mass of content, and technological finish at initial publication. This is particularly important since projects often seem to be judged by both funders and traditional humanities users according to their state at first release, as if they were a book. Once a first set of material is released, staged publication — such as the addition of new components, functionalities, or alternative interfaces — and incrementation — such as additions to or enhancement of existing content — become easier. However, in project planning, it seems strategically important for researchers to stress to funders the value of interim publications and subprojects, and generally not to allow a major deliverable to swallow up the identity of a project as a whole, so that the perception that the former is “done” does not carry with it a sense that the latter is also finished. Release or version numbers, or other ways of flagging the open-endedness of an electronic publication may be helpful in this regard. Digital projects, if they aim to move beyond prototypes and court a mainstream humanities user community, need to recognize at the planning and budgeting stage the very high overhead involved in the development of delivery systems robust and usable enough to be considered in some sense finished. We need to think through with our funding agencies not only how to sustain digital publications over the long haul, but also how to help projects with hugely valuable content leap that imposing hurdle from prototype to polished publication. At the same time, digitally published may not mean “done” in several respects. Published is traditionally done, as David Sewell argues in his essay in this cluster. But published electronic projects don’t get put on a shelf in a library. Being unconstrained by print materiality reinforces the arbitrariness of deciding that something is done in the sense of “complete”, which is defined in the Oxford English Dictionary as “Having all its parts or members; comprising the full number or amount; embracing all the requisite items, details, topics, etc. ; entire, full.” Published may mean (provisionally) done without meaning complete, and there is of course a long tradition of encyclopedic print publications issuing a series of updates or supplements. Digital publication allows us to define done in terms of the kind of intrinsic completeness suggested by the OED rather than because we’ve reached an arbitrary limit (a deadline, a word length) related to print processes. In this sense, Orlando , though published, remains incomplete. Though all the items we considered requisite for initial publication are there, we remain aware of those figures, topics, approaches, and perspectives that demand inclusion in a “full” history of women’s writing in the British Isles. Our contract with our publisher recognises the provisionality of our completion by stipulating for updates, as well as in the plan for the volumes of discursive history. We’ve increased and enhanced both content and functionality semi-annually since publication. The “done” founded on digital publication is fragile in another sense because of the rapidity of technological change. The stability of book technology means that a book can be done and put to rest by both authors and publishers: even if it goes out of print, so long as copies endure in libraries they can continue to be used in perpetuity. But digital publications require more active support. Even if no technological enhancements are desired, for an electronic text to remain usable, it has to be stored somewhere in a form that is accessible to evolving technologies. This means it requires more active curation: even a quite straightforward web publication becomes unusable if it can’t keep pace with browser releases. A new version of a project produced to migrate with current standards and practices is different from a second print edition in a number of respects. While both respond to a perception of continued demand for the product, the electronic migration is required to keep the resource accessible at all, and it does not supplement the first edition, which in the case of print will persist, but materially speaking supercedes or replaces it. This means that updates to electronic publications, while having a decided formal edge over errata slips or supplemental volumes, bear the additional burden of keeping the text in circulation. Being done with a digital publication may mean that the work disappears entirely from use. The potential evanescence of a project’s digital output creates pressures on the scholar, team, or publisher to keep it available. The academic community is still groping to discover how best to sustain digital publications over the long term. In the meantime, to meet even modest needs for technical migration and to keep content current, projects must continue to find funding, which can be challenging if a project is perceived as done as a result of publication. The Orlando Project, as part of its strategy of sustainability, licensed the textbase to the University of Alberta, and the University in turn sub-licensed it to Cambridge University Press. This arrangement created a revenue stream to help support the project’s preparations for publication and its updates and ongoing activities. It also sustains Orlando’s identity at its home institution and gives a broader constituency than the team members an interest in the project’s success. This is important because, although like other ongoing projects Orlando has been able to obtain research funding for new initiatives, maintenance funding is a major challenge. Part of the problem is in how we conceive of digital publications. Many ongoing digital publications should be understood by analogy with journals, for whom “done” can be applied to particular issues but not to the relevant research area. Continuing work despite previous publication is then part of the mandate, rather than the extraordinary burden it would seem in comparison with a book. The analogy applies only in part, because of course the entire text of a digital publication is fluid and subject to ongoing revision as that of a print journal is not. But it helps conceive more appropriately what “done” might mean for a lot of digital projects, with their capacity to increment and to migrate both technologically and with their field, just as does the analogy of the library for the Perseus Project. Indeed, from a theoretical perspective, an electronic publication will arguably never be “done” precisely because of the nature of electronic textuality. Print texts are susceptible (as indeed were manuscripts and printed texts) to all sorts of repurposing, from reissue through quotation and anthologizing, to reprinting or incorporating in works of graphic art. In a digital environment, this aspect of textuality is greatly intensified by the ease with which one can “sample” texts, and the ability to separate content from presentation in digital formats means that entire works can be readily reformed or deformed. To take a familiar digital activity as an example, textual editing in an electronic environment must be reconceived as involving several different modes of editing. A TEI-conformant XML edition can form the basis of other quite divergent editions, such as an intentionalist rather than a genetic or “fluid-text” edition such as the Rotunda Press edition of Melville’s Typee [Bryant 2006]. Scholars will increasingly be able to build on existing electronic texts, restructuring or adding to them, or recombining them with new content to produce new texts. In a radical extension of earlier forms of textuality, the possibility that an electronic text will continue to morph, be reproduced, and live on in ways quite unforeseen by its producers makes “done” to an extent always provisional. The fact that electronic texts are not static leads to the thorny issue of archiving them, surely a marker of some kind of doneness. For although the “digital archive” is used loosely to refer to the total volume of material available in digital form, attempting to do for digital culture what government, university, museums, and other organized archives have done for print culture — preserve records of the past so as to allow others to access it in the future, including selection, arrangement, conservation, cataloguing — is a major challenge. Even the term “archive” may suggest misleading parallels between older archival practices and what is possible or appropriate for digital materials. People deposit books, personal papers, or theses in an archive, where they remain, unchanged, unless a medium like acid paper demands conservation, for future generations to consult. That may be possible for some resources such as collections of static web pages, as recorded by the Internet Archive, but for dynamic digital resources such as the Orlando Project, archiving even a substantial set of web pages would be only the tip of the iceberg. The Orlando Project has committed to archiving with the University of Alberta Library, which currently entails a fairly well-defined set of practices designed to ensure long-term survival of the data. However, current practices are unlikely to be able to document either the dynamic text or the research process, which was an experiment in large-scale humanities research and computing. We can archive our internal materials, such as meeting minutes, policy documents, and so on. We have an archive of all past versions of the documents that make up the textbase, and of past versions of the delivery system (code and content), so that what it looked like in the past is recoverable. But particular versions will only be recoverable as we have machines that run the browsers and the coding behind them. We need as a community to grapple further with the question of how to archive dynamic resources. Funding bodies such as SSHRC have policies requiring the public archiving of data, even though many researchers are unaware of this requirement and despite the fact that the country lacks the standards and indeed the facilities to permanently archive digital material [MacDonald 2007]. The notice one frequently encounters accessing materials through the Library and Archives Canada Electronic Collection is a sobering reminder of what may be lost: “You are viewing a document archived by Library and Archives Canada. Please note, information may be out of date and some functionality lost” [Disclaimer]. We anticipate out-of-date information in an archive, of course, but if considerable functionality is lost, a digital artifact can hardly be said to have been archived successfully. And this site is devoted to archiving just “monographs and periodicals” rather than more complex artifacts. Archiving an experimental digital project must include the daunting task of somehow preserving not just text but code and functionality, either by maintaining systems on which they can run or migrating them to newer ones. If not, the project will be not done but done for. But archiving alone would represent a form of doneness that many digital projects hardly seek. We want Orlando to be up and running, to be alive and evolving, being updated and used far into the future. Such longevity in more than an archived state has major implications in terms of resources. Lack of people, time, or funding has consigned more than one project involuntarily to becoming a static tribute to its former activity. The reasons for this include people moving on, intellectually or institutionally, without taking their projects along with them, or people using electronic media to disseminate without particularly desiring to exploit their potential for continual updating, but even where the will to continue persists, inadequate funding mechanisms for sustainability may make it impossible. This is a shame, since, as we have argued here, in the case of Orlando and many other digital publications not only does there remain the potential to enrich the contents, but the first iteration often merely begins to tap the potential of the project’s data architecture and potential for interface development. Yet once a project publishes a first major release of materials, the assumption that the research is finished makes attracting funding more difficult. While experiments with various models of maintenance and sustainability proceed with both subscription-based and open-access digital publications, it is clear that a fundamental shift is needed in the understanding of the value of project sustainability and ongoing development, along with a concomitant shift of funding models [Unsworth et al. 2006, 28, 32]. Nor should sustainability be narrowly conceived. Informal user feedback on Orlando suggests that, at least with respect to encyclopedic resources, users now firmly expect that scholarly digital publications will be kept up-to-the-minute and respond to user suggestions. Most digital humanities projects presumably would wish to benefit from this respect in which they remain “undone”: if we are to evolve useful tools and resources we need carefully to assess how people use them and experiment with ways of making them better. Such inquiry is integral to the Orlando Project’s continuing research, since two of its major aims were to establish the viability of extensive, domain-specific semantic markup to enable new kinds of scholarship, and to help shift scholarly users of electronic materials towards more complex engagement with electronic resources. The project also aimed to leverage the markup in ways that we did not have the resources to implement: whether we can ever have done with, that is to have realised, those ambitions will depend on future developments. The Orlando Project directs its research towards two practically inexhaustible fields: women’s literary history and the capacity of computing — specifically of extensive XML markup — to serve the needs of this area of humanities inquiry. “Done” becomes, over the course of such an ongoing and complex digital project, a strategic, continually negotiated marker valuable in a range of ways for defining a specific stage of a process which is not unlike that of Lady Mary Wortley Montagu’s solo periodical “To be continued as long as the Author thinks fit, and the Public likes it” [Montagu 1993, 105]. Although Orlando diverged radically from the sense of authorship invoked here, Montagu conjures succinctly a dynamic relationship between continued production and reception that is as true to the era of digital production as it was to print culture in the eighteenth century. “Done” for Orlando the textbase is only newly open, that is beginning, for our users. For this project, so closely focused on a major deliverable, the post-publication phase has simply intensified the importance of the enquiry that binds our two fields of research: that of the relations between Orlando and its users. Although they are by no means all unique to digital publication, the factors outlined here, ranging from project conception and design through modes of textuality and publication to complications in sustainability and archiving, work collectively to complicate what “done” means in the context of digital research. They come of participating in a rapidly transforming context for research and publication in the humanities. Many of these threads are tied together by a common concern that has not been present for major projects that issue in print publication: the question of how to make the results of the research continuingly available to others after the point of initial publication. Whatever “done” means for a particular project, those involved face the challenge of ensuring that it does not paradoxically mean a swift end to scholarly circulation and contribution. While a comparison to the loss of the library at Alexandria in the pre-print era might be a tad hyperbolic, it is sobering to contemplate the waste of knowledge and intellectual effort that would result from the failure of the academic community to resolve the thorny problem of how to sustain access, over the long term, to the results of the first generation of experimental endeavours in the digital humanities if we can’t figure out what is to be done. Even with the relatively straight-forward conversion of analog to digital materials, one large-scale archival project found that the cost of an internet-accessible indexed page was about seven times that of the per-page OCR scanning [Internet Library 1999], and the estimate excludes IT and library infrastructure costs. For more complex, experimental, or born digital resources, the delivery development work and costs are bound to be considerably greater. Brown, Susan, Patricia Clements and Isobel Grundy. Orlando: Women's Writing in the British Isles from the Beginnings to the Present. Cambridge University Press Online, 2006. http://orlando.cambridge.org/. Brown, Susan, Patricia Clements, Renée Elio and Isobel Grundy. “Between Markup and Delivery; or Tomorrow's Electronic Text Today”. In Raymond Siemens and David Moorman, eds., Mind Technologies: Humanities Computing and the Canadian Academic Community. Calgary: University of Calgary Press, 2006. pp. 15-31. Bryant, John, ed. Herman Melville's 'Typee': A Fluid-Text Edition. University of Virginia Press, 2006. http://www3.iath.virginia.edu/melville/. Crane, Greg. Perseus Digital Library. Tufts University. http://www.perseus.tufts.edu. Disclaimer. Electronic Collection: Virtual Collection of Monographs and Periodicals/La collection électronique: Collection virtuelle de monographies et de périodiques. Library and Archives Canada/Bibliothèque et Archives Canada. http://epe.lac-bac.gc.ca/003/008/099/003008-disclaimer.html. Eaves, Morris, Robert Essick and Joseph Viscomi, eds. The William Blake Archive. Institute for Advanced Technology in the Humanities, University of Virginia, 1996-present. http://www.blakearchive.org/. Warning: Biblio formatting not applied. HarleyDiane. Use and Users of Digital Resources: A Focus on Undergraduate Education in the Humanities and Social Sciences. Berkeley, CA. Center for Studies in Higher Education, University of California, Berkeley. 2006. http://cshe.berkeley.edu/research/digitalresourcestudy/report/digitalresourcestudy_final_report.pdf. Hayles, Katherine N. “Translating Media: Why We Should Rethink Textuality”. The Yale Journal of Criticism 16: 2 (2003), pp. 263-290. Warning: Biblio formatting not applied. Internet Library of Early Journals. Internet Library of Early Journals (January 1996 - August 1998): A Project in the ELib Programme. Final Report. March 1999. http://www.bodley.ox.ac.uk/ilej/papers/fr1999/. Levine-Clark, Michael. “Electronic Books and the Humanities”. Collection Building 26: 1 (2007), pp. 7-14. MacDonald, Moira. “Data Storage Policy Can't Be Enforced”. University Affairs 4 (June 2007). http://www.universityaffairs.ca/data-storage-policy-cant-be-enforced.aspx. Mandell, Laura, ed. The Poetess Archive. http://unixgen.muohio.edu/~poetess/. Montagu, Lady Mary Wortley. Essays and Poems and Simplicity, a Comedy. Edited by Robert Halsband and Isobel Grundy. Oxford and New York: Oxford University Press, 1993. The Nora Project. The Nora Project. http://www.noraproject.org/. Matthew, H.C.G., and Brian Harrison, eds. Oxford Dictionary of National Biography. Oxford: Oxford University Press, 2004-2007. http://www.oxforddnb.com/. Oxford English Dictionary. Oxford English Dictionary Online. Oxford: Oxford University Press, 2007. http://www.oed.com/. Warning: Biblio formatting not applied. CarolTenopir. Use and Users of Electronic Library Resources: An Overview and Analysis of Recent Research Studies. Washington D.C. Council on Library and Information Resources. 2003. http://www.clir.org/pubs/reports/pub120/pub120.pdf. Warwick, Claire. “Print Scholarship and Digital Resources”. In Susan Schreibman Ray Siemens and John Unsworth, eds., A Companion to Digital Humanities. Oxford: Blackwell Publishing, 2004. pp. 366-382. Warwick, Claire, Melissa Terras, Paul Huntington and Nikoleta Pappa. “The LAIRAH Project: Log Analysis of Digital Resources in the Arts and Humanities”. Presented at Arts and Humanities Research Council. Final Report to the Arts and Humanities Research Council (2006). Wiberley Jr., Stephen E. “Habits and Humanists: Scholarly Behavior and New Information Technologies”. Library Hi Tech 9 (1991), pp. 17-21. Wiberley Jr., Stephen E., and William G. Jones. “Time and Technology: A Decade-Long Look at Humanists' Use of Electronic Information Technology”. College Research Libraries 61: 5 (2000), pp. 421-431. Women Writers Project. The Women Writers Project. http://www.wwp.brown.edu/.